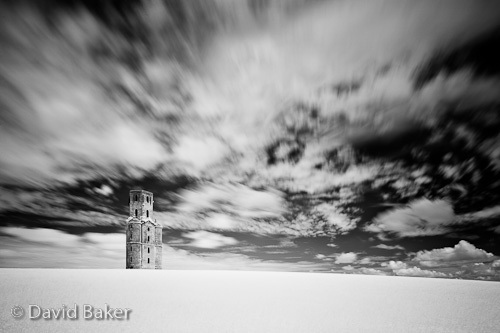 Another trip out with the infrared yesterday, starting at Horton Tower, Horton, Dorset. 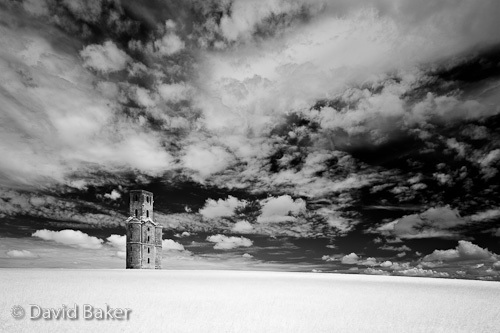 I find that when shooting a structure like this it’s essential that you have a great sky behind it, especially when it is so isolated and stands alone, yesterday’s sky was perfect so I headed out with this shot already in mind having already done a recce of the location a while ago. The Lee Filters Big Stopper adds a twist on any location that you shoot and I am finding that I am regularly shooting the same scene with and without the filter. The problem is I often struggle to decide which one I like the most! ~ by David Baker on 7 June, 2010. I prefer the shot without the big stopper. I just got my own big stopper last week and have used it a couple of times so far and also shot the same images without it. The images I kept are without the big stopper. The right photograph for the big stopper has not presented itself to me yet. I’m sure it will in time. When did the adverts start appearing?? I’m starting to pref the one with the Big Stopper I think I need to live with them both for a while to truly make up my mind.